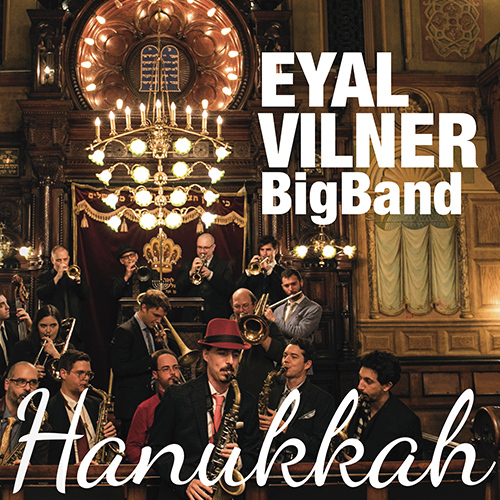 In the spirit of holiday traditions, the Eyal Vilner Big Band has put together a historic, yet modern take on the Hanukkah season. Vilner, a New York based, Israeli born altoist and conductor of the Big Band, not only has a keen eye for talent, as demonstrated on all of his releases Introducing the Eyal Vilner Big Band, and Almost Sunrise, but the real meat and potatoes is in the creative arranging and above all, the originals Vilner conceives. On this holiday offering, he has outdone himself once again. The blending of holiday melodies with sounds influenced by jazz and swing, Israeli, Jewish and Middle Eastern music, in addition to Brazilian Choro and Afro-Cuban rhythms. Though titled Hanukkah, it really is a holiday spectacular listen for the holiday season in general, no matter your religious affiliation. “Sevivon” (The Dreidel Song) is given a festive samba rhythmic structure that matches the lyrics perfectly. The opening line of the traditional Hanukkah song is, “Dreidel, spin, spin, spin,” and Vilner captures the imagery in the music in a joyous and festive manner. Opening with the drums that sets up the samba beat, the melody is introduced by guest flutist, Itai Kriss. Vilner’s arrangement has exciting band hits, beautiful brass voicings and wonderful counterpoint between the saxophone section and brass section. As the cymbals swirl the horns start a rhythmic figure that is developed against a trilling horn figure, one can just hear the spinning Dreidel and this all leads to a wonderful orchestrated statement of the melody that has excellent counterpoint and hip brass effects. Kriss’ flute solo is wonderful, full of energy, but never loses the melodic nature of the original melody. Vilner takes a solo with his pen and writes a section inspired by Choro music and a special section dedicated to Batucada music (a Brazilian drum ensemble). In this section, Vilner layered each horn with a different line, based on a drum part from the traditional Batucada ensemble. The result is a building arrangement that is exciting and full of depth. “Oh Hanukkah” is a swinging treat! The three-part harmonies by vocalists Tamar Korn, Martina DaSilva, and Vanessa Perea are engaging. With the band in full-swing mode and the horns popping, and the clarinets flowing, the vocalist will take your ears right back to the roaring 20’s, albeit Vilner’s arranging is hipper! Vilner tributes the legendary New Orleans vocal group of the Boswell Sisters as his inspiration for writing the vocal parts. Evan Arntzen takes a fine tenor solo. Vilner is a master at adding little extra sounds and colors in his arrangements that make them unique and highly entertaining. Like the plunger used on brass and the woodwinds switching from saxophones to clarinets, it’s the little things that all add up to make this a great track! Vilner’s latest offering Hanukkah is a must add to any holiday collection, but in truth its just an overall great listen and well worth the price of admission. Vilner has compiled a great mix of Hanukkah songs, all of which are familiar, but Vilner’s arrangements combined with the unique styles and the sound sound of the Museum at Eldridge Street, makes this album something special. Well done, and enjoyable throughout.